As a business owner, you may be wondering, “why do I need SEO services?” or “how can SEO help my website?”. These are all very good questions. If you want to know what seo is, then click on that link and we can dive more into that topic. But if you know what SEO is and want to know how it can benefit your business and your website, then your in the right place. Before we begin I want you to just think about the process that you take when you are looking for a new product or service you need. Let’s say you needed a plumber. Before picking one, you might do a little bit of research first. You might ask a few friends or business owners who they use for a plumber. Then you might google “plumbers in your town” or “your town plumbers”. You would then maybe compile a list of a few companies you find on the first page. Then maybe you might look for some reviews. Then maybe start calling around. SEO can help with a lot of this and if you didn’t show up when that person was looking for your services then you wouldn’t even make the list. That’s why it’s important to show up on the first page of Google when your potential customers are looking for your services. So, we put together a list of all the benefits that SEO can do for you and your business. 1) Your Competitors Are Doing It – When your competitors are investing in SEO and you’re not, their websites will move up in the rankings and yours will be invisible. Think about it this way – If your potential customers are looking up your products or services and you don’t show up on the first page of google, how will they find out about you. What good will it be if no one can find your website. On top of that if your competitors are doing it and showing up on the first page of google, then their getting that business and your not. Your missing out on a lot of potential business. Below is a graph by Borrell Associates that shows the amount of money businesses in the United States are spending on SEO since 2008. Every year it has gone up. 2) SEO Helps Your Customer Find Your Website – When potential customers search for products or services online, very few look beyond the first page of results, so it’s crucial that your website is there. Think about it this way – when a potential customer looks up a certain service or a product that their interested in, you want to be the first person they see. In order to do this you need to show up on the first page of Google when they search. 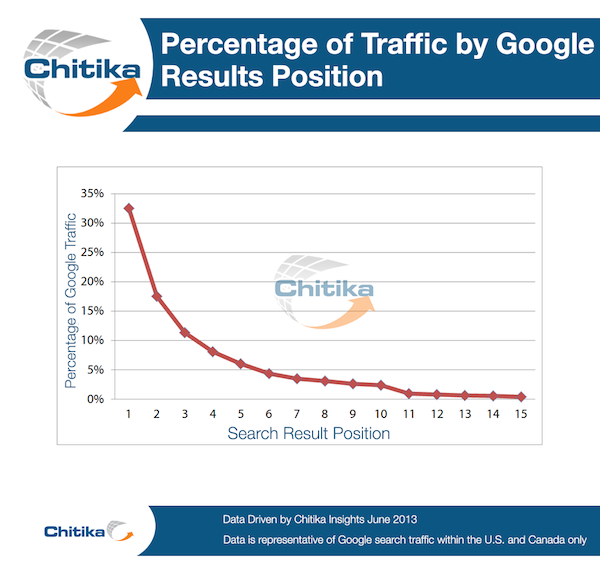 This graph by Chitika shows the importance of being on the first page and the amount of clicks each position gets. The higher you are the better chance you have of someone clicking on your website. 3) It’s Cost Effective –SEO is one of the most cost-effective marketing strategies because it targets users who are actively looking for your products and services online. SEO’s inbound nature helps businesses save money as opposed to other outbound methods like direct mail, trade shows, print, or cold calling. While cold-calling can still be an effective strategy, the leads generated cost 61% more than leads generated by an inbound strategy like SEO. And since SEO also targets users who are actively searching for products and services like yours, the traffic resulting from SEO is more qualified than many other marketing strategies, resulting in cost-savings for companies. This bar graph by HupSpot demonstrates this point. 4) Most Transactions Begin with a Google Search – 81% of consumers and 77% of B2B customers use search engines to research their purchases. 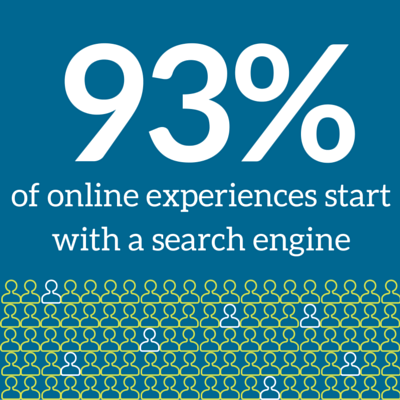 A study by imFORZA shows that 93% of online experiences begin with a search engine, again highlighting the importance of having a high ranking on search engines like google. Another similar study published by Search Engine Land shows that search engines account for 300 percent more internet traffic sent to websites than any other marketing tool. All these numbers highlight the importance of having a presence online and investing in search engine optimization to guarantee the best ranking on SERPs. 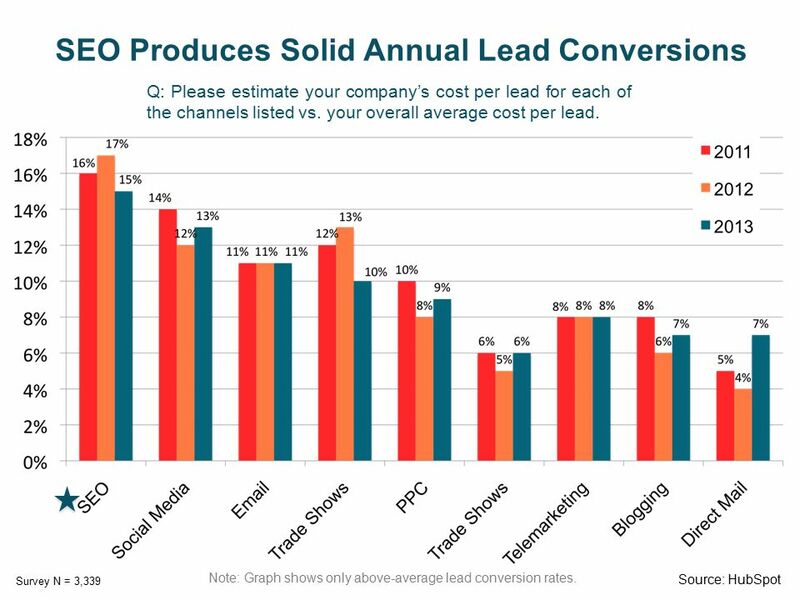 5) Inbound marketing methods (including SEO) result in more leads than outbound, paid media or self sourced leads. 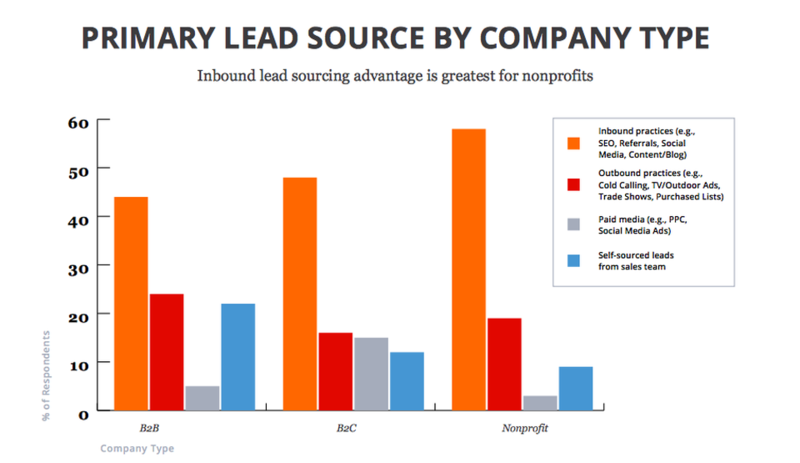 According to this study, B2B, B2C and non-profit companies state that SEO is one of their primary source of leads. This report also showed that SEO among marketing professionals, was the number 1 source of leads over the last 6 months. So you have to ask yourself, if your not getting those leads through google and other search engines, who is? Your competitors?